SINGAPORE–(BUSINESS WIRE)–TD Ameritrade Singapore Pte. Ltd. is bringing U.S. financial market updates, investor education, research and trading to its retail investors in Singapore through Facebook Messenger. 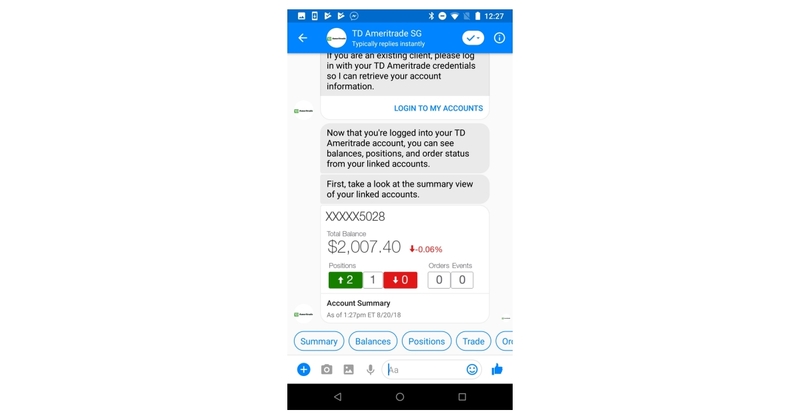 TD Ameritrade’s chat bot for Messenger – powered by artificial intelligence (AI) technology and backed by live client service support – will give local retail investors one more way to access the U.S. equity markets and their investments where they are, when they need support, and in the most natural, conversational way. By connecting with TD Ameritrade through Messenger, investors in Singapore can access on-demand market information, news and events; receive quotes and sector information presented in visual format with charts and graphs; and watch educational videos about investing. Equity and ETF trading is also available. Get updates on U.S. markets, indices and sectors. Get a quote, track company events. Check account balances, positions, order status and place trades. Chat with an automated agent or a live human agent any time. TD Ameritrade’s chat bot for Messenger is augmented by human support, making it a true hybrid experience. When appropriate or necessary, client support specialists can intervene in multiple ways, including interacting directly with the client. Investors in the U.S. can currently connect with TD Ameritrade through third-party platforms including Facebook Messenger, Amazon Alexa, Apple Business Chat and Twitter Direct Message. Scan the QR Code to connect with TD Ameritrade Singapore on Messenger. TD Ameritrade Singapore Pte. Ltd. (Reg. No. 200902152D) is licensed by the Monetary Authority of Singapore and does not provide tax, legal or investment advice or recommendations. Products and services offered in Singapore are provided by TD Ameritrade Singapore Pte. Ltd. and nothing in the published material is an offer or solicitation to conduct business in any other jurisdiction. TD Ameritrade Singapore Pte. Ltd. trading as TD Ameritrade. The TD Ameritrade logo is a trademark jointly owned by TD Ameritrade IP Company, Inc. and The Toronto-Dominion Bank. © 2018 TD Ameritrade IP Company, Inc.